Do Great Danes make good family guard dogs? What's a guard dog anyway? Ask yourself how you interpret the phrase "guard dog" then consider the difference between a true guard dog and a family guard dog, or watchdog as commonly referred. The point is that many people misinterpret the term "guard dog" and here's how. A guard dog guards something, be it a commercial office property, a locked home filled with valuables, or other area that is quarantined and secure to casual entry. A guard dog is trained to attack anything, or any one that encroaches, trespasses, or steps foot on its territory. Unfortunately, this could be an innocent person, child, or other animal that was never a threat! TIP: Want to learn more about the unique demeanour & temperament of this visually intimidating breed? Don't miss our Great Dane Breed intro section for additional excellent insight! Guard dogs, also referred to as patrol or sentry dogs, have a low level of socialization and are typically chosen from a more naturally aggressive breed than Great Danes. Once put "on duty", they do one thing, guard and protect an area and anything that trespasses upon it. There are no commands or handler/trainer control, the dogs are on their own and programmed to attack! True guard dogs are very aggressive, territorial and defensive by nature. With limited socialization and obedience, they react on instinct. Typically, only the handler and select individuals can control a guard dog. When off duty, they are not good around children, other dogs or family members. We can see why a Great Dane as a guard dog, in the true meaning of the term, is not a suitable candidate. Centuries of select breeding has refined the modern day Dane into a companion animal. Breed standard of the Great Dane states character and temperament as "always friendly and dependable", this is a far cry from what makes a true guard dog. Truthfully, Great Danes are perfect as a watchdog, family guard dog if you prefer, with some true guard dog qualities. Watchdogs encompass a wide variety of breeds ranging from the smallest toy breed like a Chihuahua, or Miniature Pincher, to giant impressive breeds like a Great Dane. Watchdogs have a common similarity, they will bark, yip, grumble or shout when something is out of the ordinary. Your Great Dane as a family guard dog and for home security makes perfect sense. The boisterous mighty bark of a Dane will send most intruders fleeing for their lives. A low rumble and a statuesque gaze through a bedroom window will cause most would be intruders to freeze in their tracks, or do a 180 and run! This in a sense is guarding as we see it. In summary, a properly raised and socialized Dane is not a liability. Aggressive behavior and unexpected attacks will not be a problem. 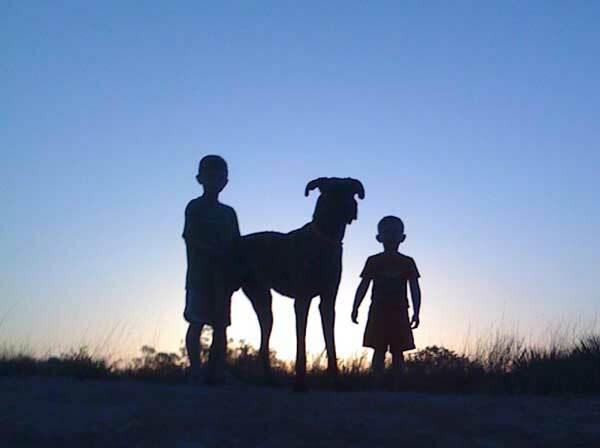 The trustworthy Dane will thrive in a family environment and is quite gentle with small children and other animals. A Dane's timidness and suspicion towards strangers is commonly addressed with passive confidence yet their sheer size and powerful deep bark is very intimidating and a wonderful deterrent against any threats to you and your family. With incredible power and strength a Great Dane is more than capable of taking down any intruder at will. Certainly Great Danes can be trained as guard dogs or personal protection dogs, but by nature, they thrive and excel as watchdogs, holding calmly and silently their power and force. Better yet, a Danes sheer size, piercing gaze and intimidating appearance in most cases will defray any chance of danger before it can manifest. Should a bold intruder ignore the warnings, your Great Dane is aptly equipped to defend family and territory with the speed and ferocity of a mighty boar hunter!